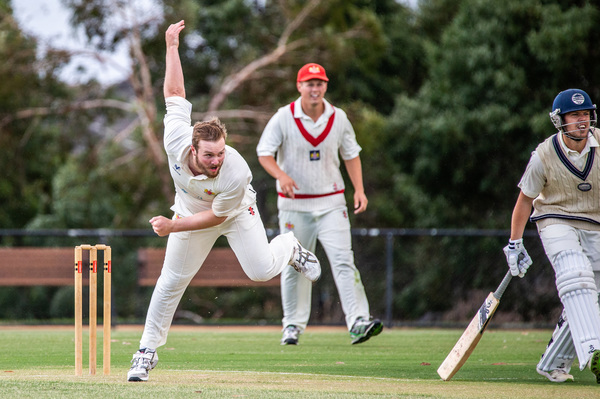 It came right down to the wire, but Nathan Lambden’s whirlwind knock late on day two just wasn’t enough for Casey-South Melbourne to hold on to a draw against Geelong at Casey Fields in the Saturday/Sunday fixture. The Cats had control over large parts of the contest after being sent in to bat on day one, with wild weather preventing any play until 2.30pm. Left-armer James Maxwell (3/53) broke through in his first over, removing opener Nick Browne, but out stode Cats’ skipper Eamonn Vines, who was perhaps giving a life early after Maxwell appeared to have trapped the star bat in front, but the umpire didn’t agree. But the Cats made the most of their chances, to find some momentum and forge ahead. The visitors got to stumps 4/166 off 56 overs, with Vines looking a class above, racing out to 74, and eyeing a century on the next morning. Day two saw the Cats resume under grey skies, with skipper Vines picking up where he left off. Left armer James Maxwell picked up his third wicket early after very nearly picking up one the ball before, breaking through the gate of Josh McDonald for 12 to give the home side a strong start. While Vines made batting look easy on the other end as he continued to work the ball into gaps and put away the bad balls, Tim Ludeman copped a barrage of short balls early from Nathan Lambden, in an attempt to sway him into playing an expansive shot with two men out on the hook or pull, but quickly worked his way to 15. But a stunning two-over patch from Jackson Fry (2/43) – replacing Lambden – saw the Swans wrestle back the momentum. Fry hung one out wide to lure Ludeman into a false stroke, finding the edge to Dev Pollock behind the stumps in an excellent wicket-maiden to begin his day. In the left-armers next over, he completely destroyed the stumps of Dom McGlinchey after building some excellent pressure with his stump to stump line and length. Despite the Cats falling to 7/216, Vines continued on his merry way, eventually crossing to yet another Premier century with an elegant clip off his toes. With a declaration looming, Vines – and Brenton McDonald- upped the ante, quickly compiling 63-runs between them, and looked for the boundaries on a deck well suited to batting. The outstanding late surge ended with a crunching six, with Vines declaring with his side on 7/279 off 79 overs, with the skipper ending on 122 off 236 balls and McDonald with an almost run a ball 33. Handing the Swans a tricky 15-minute burst before lunch, The Cats very nearly had Ryan Quirk in the final over before the break, with the young opener giving a sharp chance to gully, but survived as the home side went in unscatched. But constant wickets dented their progress after lunch, with Wells falling for 30, and Quirk for a very well-made 38, and despite the majority of batsmen getting starts, the Swans were well on their way to a loss. At 9/177, the 103 runs needed to pull of victory seemed like an eternity away – put simply, as brave as Casey-South Melbourne have been for the majority of the season, it was a mountain too far to climb. But Nathan Lambden had other ideas – he didn’t want to just allow his side to just give up the points without at least making the Cats work for them. In a stunning 94-run stand for the final wicket with Jackson Fry (a club record since moving to Casey), Lambden pumped out a breathtaking 69 (his first half-century at the level), sending 12 balls to the rope and another over the fence to get the Swans near enough to victory, or at the very least, a respectable draw. The Cats eventually broke through, snaring Lambden in the dying moments of the match to seal the win, but it was a fine 90 minutes of batting that turned heads. The fact that the Swans took until the very final over of the day, and could have nearly pulled off a remarkable victory is a testament to the ‘never give up’ attitude the club has deployed, but it’ll go still go down as a potentially costly loss so close to finals. Now sitting in ninth spot after holding a spot in the eight for so much of the season, the Swans need to find their groove with two matches left of the home and away season. Dandenong, meanwhile, advanced into fifth spot on the table after yet another Brett Forsyth masterpiece. Forsyth crunched his second century of the season to go with his seven half-centuries to cross the 1000 run mark (including Twenty20s) for the season, combining for a patient knock to roll Greenvale by eight-wickets. The Panthers bowled superbly on day one, with Pete Cassidy (4/33) and Englishman Josh Shaw (3/32) helping roll the ‘Roos for just 166, giving the visitors a tricky one over to face before stumps. Rolling out a rare nightwatchman to open, Cassidy joined Forsyth at the crease and managed to survive the six balls. But, on the second day, the pair forged ahead, grinding the Kangaroos into the ground to patiently push towards the target. The pair combined for a stellar 128-run opening stand, with Cassidy finally falling for a brilliant 154-ball 58, but Forsyth continued on his merry way, helping the Panthers past the total before nudging a single into the off-side a few overs later to reach triple-figures. Stumps were immediately called, with the Panthers finishing on 2/184, a win that basically ensures they will get a chance to defend their premiership with another finals appearance. Pearcedale has already conceded first-innings points in a lop-sided clash against Langwarrin at Lloyd Park. The Panthers batted first, and were rolled for 79 in 48 overs, and the Kangaroos reached 4/100 by stumps, with former Tooradin star Tom Hussey unbeaten on 35. In other matches, a sparkling 156 to former Premier Cricket jet Ben Clements guided Mornington to a monster 7/352 against Baxter, Flinders are 1/2 after Peninsula OB racked up 189, while Sorrento faces a tough ask after slumping to 5/59 in reply to Mt Eliza’s 118. Endeavour Hills were stunned by a rampaging Mt Waverley bowling group on Saturday. Chasing 252 away from home, the Eagles were dismissed for a lowly 63, with Jake Rigby the star with 4/5 off his eight overs. Noble Park also suffered a defeat, going down in a thriller against Box Hill at Pat Wright Sr Oval. Needing 149 for victory, the Parkers fell agonisingly short, dismissed for 145 in the 77th over, with skipper Luke Wintle in the runs again with 43. Due to heavy rain that fell in Warragul on Saturday, only one Division 1 game was completed and it resulted in Drouin just scraping home against Neerim District to keep their finals hopes alive. The Hawks resumed day two at 3/96 after restricting the Stags to 168 and made hard work of the 73 runs required for victory. On a pitch that offered seamer Toby Bayne (3/65) a lot of assistance, he delivered a withering spell to have Drouin struggling at 5/107. The Hawks composed themselves as Sam Van Der Zalm (31), Jake Harper (22) and skipper Trevor Gardiner (22 not out) led them to victory with a total of 8/197. All other games failed to garner results as rain set in and washed out play. After restricting Buln Buln to 161 on day one, top-placed Western Park wasn’t given the opportunity to chase down the required runs, while Yarragon’s (315) dominant day one performance against Ellinbank went to waste and the battle between Jindivick (1/55) and Hallora (299) was also called off. In other news, the All-Gippsland XII team was announced last week with WDCA stars Fraser Duncan (Hallora) and Troy Lehman (Western Park) making the cut. It’s Duncan’s fourth All-Gippsland nod and Lehman’s first.